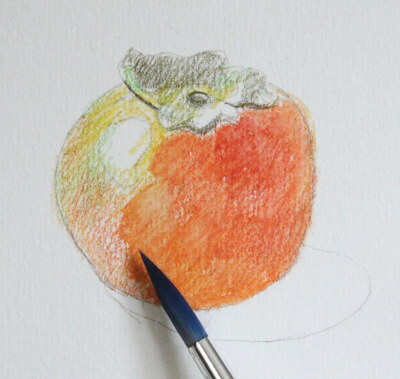 In this simple watercolor pencil tutorial, I want to show you how to use water soluble colored pencils to create a persimmon. The process more or less follows that of the tutorial using waxed based colored pencils. I have kept it simple and easy to understand. Whether your chosen medium is colored pencils or conventional watercolors, I hope this tutorial will help. To start, I laid out a very light drawing with a graphite pencil, keeping the lines neat and clean. Next I gathered all the colors I expected to use from the pencil set and laid them out in front of me. I then applied the first layer of colors to establish the overall value relationships and major color blocks. I kept the hatching in one direction and 'wove' the lines as seamlessly as possible with sharpened water color pencils. With a semi-wet round watercolor brush, I carefully put a second layer of color across the painting. Remember, the brush is wet, so only paint across one patch of color at a time. I cleaned the brush every time I finished a given color area. The trick when using a watercolor brush is not to leave behind hard edges around the colors. And voila! Here is the first wet layer in the watercolor pencil tutorial. The colors are significantly intensified and the colored pencil strokes have disappeared. The texture of the painting is smooth and rich. After the water has intensified the colors, it's a good time to darken some of them--especially when they are in the shadows. Here, I added more alizarin crimson and red violet into the shadow on the fruit. 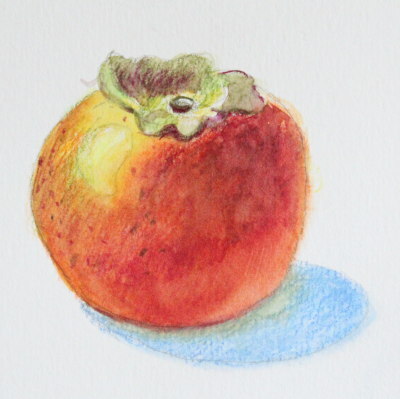 I also incorporated darker shades of orange, red, yellow and green on the persimmon. 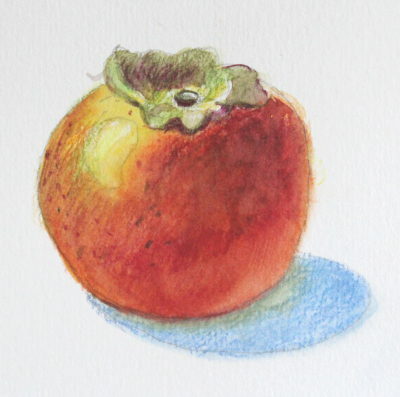 The cast shadow of the persimmon was hatched with blue, and plus I added some reflective yellow for highlights. To make the new layers of dry pigment blended into the already smooth colors, I took my moistened brush and softened the edges of the dry layers. I also added more colors to the cast shadow. 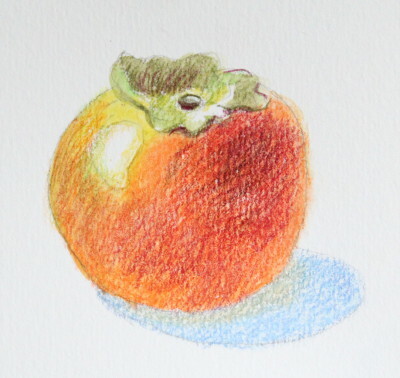 With needle sharp pencils, I added dots, spots, and sharp lines to the persimmon. I once again 'wove' in some additional colors using very fine hatching. Then I took a wet brush to lift off some colors to the right lower area of the persimmon, indicating the reflected light. The advantage of using a water soluble colored pencil is that you can erase, to some extent, unlike wax-based and oil-based colored pencils. The only thing you can't do with watercolor pencils, is burnishing the painting like you can with other types of colored pencils. This is as far as I went for this watercolor pencil tutorial. I hope you enjoy it, and that you'll have the urge to get started with your own artwork! If you haven't used watercolors before, you may want to give water soluble pencils a try before you paint with conventional watercolors. 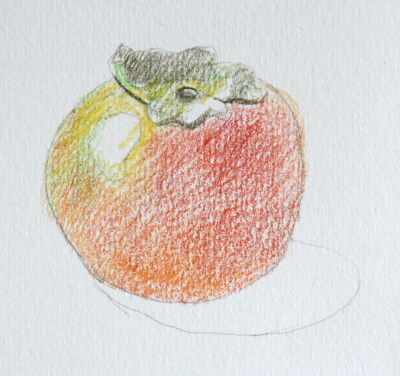 Water soluble colored pencils have many advantages over watercolors and wax/oil-based colored pencils. From this tutorial, you can see that you have more control with watercolor pencils than with conventional watercolors which require brushes and copious washes. Also, being able to intensify the colors, or make them translucent using water instead of burnishing saves time. I often use watercolor pencils together with other mediums (such as traditional watercolors or wax/oil-based colored pencils). I also take them with me when I travel. They are great for plein air painting on the go. 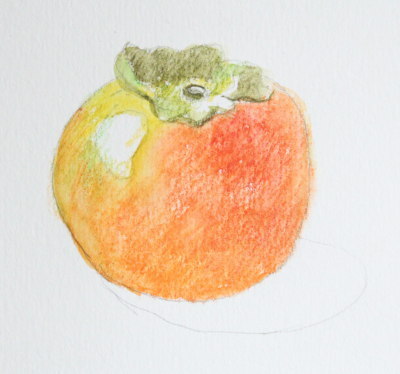 Learn more about how to use watercolor pencils here.